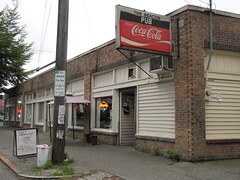 Tonight is the last night of the Beacon Pub, and so it’s the Last Ever Beacon Pub Solstice Social, from 7:00 pm to 1:00 am at the Pub, 3057 Beacon Avenue South. The Pub is closing and moving to Hillman City. The current Pub site on Beacon Avenue will become a pizza parlor next year. That’s right: the Beacon Pub’s last night is this Wednesday. It’ll be too crazy to get any business done, and it’s not the time of year for business anyway! This will be a good night to get together with friends and remember the good ol’ days and think ahead to the ones on their way. Come have some cheer and a tear for our neighborhood pub! and Happy New Year!